TheEdit Portal Settings screen allows you to modify portal settings that change the portal's appearance and behavior. 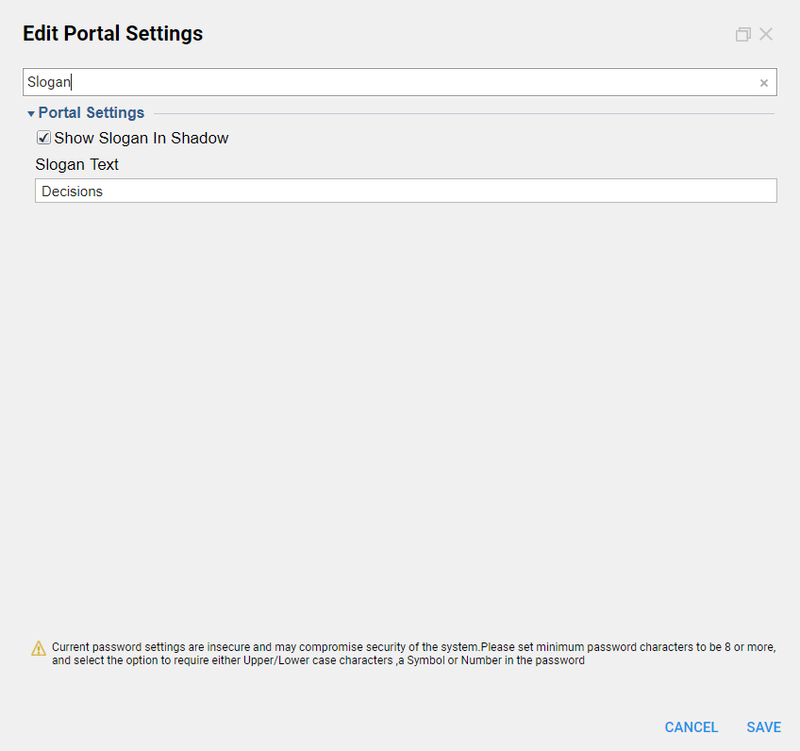 Changes made in the Edit Portal Settings screen are applied immediately and are visible to all users. In the example, we make changes in the Edit Portal Settings screen, then see how these changes take effect. We will change the auto-lock setting, which specifies whether the portal should lock if it has been idle for a set period of time. We will also change the logo and the name that appears above the address bar. 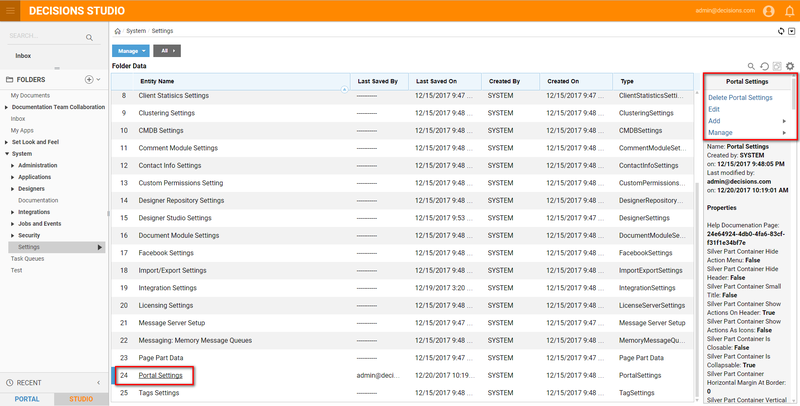 Begin by navigating to the folder System > Settings	and click Portal Settings	from the folder tree on the left hand side. ClickPortal Settings	from the Folder Data	panel. Or, click Edit	on the right hand side under Portal Settings	. In theEdit Portal Setting s dialog, change the settings for Auto Lock. Click the Auto Lock Screen	checkbox, and set the time for 10 seconds. Auto Lock	and its correspondingAuto Lock Timeout	are for specifying the amount of time without action before the session is locked. Logout Lock Delay	means after an instance is locked, it will log out after the specified time. Session Timeout	is the length of time the session can be alive regardless of activity. Next, change the logo that appears in the portal above the address bar. To change the default logo, in the Edit	Portal Settings	dialog, type Logo	in the search bar or, scroll to the Logo	section to select the image. Click Choose File	, in the resultingdialog, select the image file and click Open	. To update the text that appears in the address bar and above it, in the Edit	Portal Settings	dialog, type Slogan Text	in the search bar or, scroll to the Logo	section. Type the desired message in the Slogan Text	field. This updated text will appear in the portal in the address bar and above it. Click SAVE	to save changes.